If you are being faced with a move to another city or even across country, there is no need to despair over what to do with your special pets that live in your aquarium. You don’t have to look for a friend who would like to inherit them or take them to a fish store for someone else to have. With a little patience, the correct handling, items that you will need for the move and proper instructions, this move can happen easily for both you and your pets. They will arrive at their new home and surroundings with minimal stress and upset. I have written in detail how this move can happen easily. I have helped several of my friends (both human and aquatic) pack for a move, and in all the years I have been doing this, we have only lost one fish friend in the process. He had been around for quite awhile, and we all assumed that he was just too old to make the trip. By following these instructions, you should all arrive at your new destination in pretty good condition. You will probably be more stressed than the fish adjusting to your new “environment”. Two days before the move, stop feeding the fish. This will keep them from fouling the water and using lots of oxygen during the trip. You will need to have large plastic bags (like the gallon zip lock type or bags from your LPS), and if possible a styrofoam cooler for insulation. If there is some type of container that you can put some of your aquarium water in to take with you, this will be great; but if not, that is okay too. The "day of the move", the tank is the last thing to go. 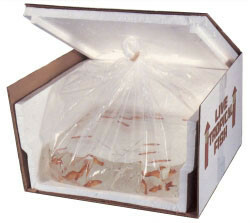 The fish need to be placed in the large bags separately with enough water to cover them while laying flat, a shot of stress coat or equivalent and filled with as much air as possible. If by chance, you are moving a larger fish or one with “spiny fins” that will tear a plastic bag to shreds, an unused and rinsed container (that can accommodate the size comfortably) with a lid will work for him. Take another bag with some aquarium water and put your filter media in it. This will hopefully save some of the bacteria for startup at your new home. You can also do this with plastic plants, decorations, gravel etc. to keep as much bacteria intact as possible. If you can save some of the water in another container--good.--but if not throw the remaining water away. Do not move your tank with any water or gravel remaining in it. This creates stress to the glass and seal and can cause leaks. Pack the other items in water safe containers or additional coolers if possible. And pack the tank so that it is the first thing that you "unpack" upon arriving at your new home. If by chance there should be an aquarium already up and running at your destination, I would not advise putting your fish into this tank. They are adjusted to the bacteria, water, etc. of your old water and adding them into another tank could cause stress and illness. If the trip takes two or three days, your fish should be okay. When you stop for the evening, and you are concerned that their air supply is running low; you can do one of two things. You can purchase a battery-operated pump or have on hand an electric pump and airline and when you stop for the evening, give each bag some oxygen. If neither of these is available, you can open the bags and swish the water to get fresh air into the bags. You may be worried over this, but here is something to think about. When fish are shipped to retailers, they are usually in the bags at least two days, and usually arrive at the store in good condition. You have finally arrived at your new home, your tank is up and running, filled with the "new", conditioned water, the temperature is correct and you are ready to add the fish. Acclimate them very slowly. Place the bags in the tank and let them sit for about 15 minutes. This allows the water of the bags to become nearly the same temperature as the tank. After 15 minutes, add l/2 cup of the "new" water into the bag. If after 15 minutes, the fish appear to be okay (no darting or gasping for breath) pour another l/2 cup into the bag and wait another l5 minutes. If all is going well with the fish after l hour of adding the new water at these intervals, you can gently release the fish into the tank. By doing this very slowly, you are adjusting your fish to any pH or hardness differences of the new water. By using the “damp” gravel, the old filter media and any plants or decorations from the old water, you have partially established the tank with the needed bacteria. However, check your water perimeters frequently for the next week or so to watch for possible spikes that might occur if the tank might not be completely cycled. Do water changes as necessary to keep the water safe for the fish. Now that wasn’t so bad was it? I hope that I have made the moving of your fish and aquarium a little easier for you. While your fish will be relaxing comfortably, not really knowing they have moved as their “home” still looks the same, You, on the other hand, still have all those boxes to unpack! back to main article list.